Pottery or stoneware, relief, 2.0L, pewter lid, text varies. “Und nähert sich solch einem Schoppen, mein Herz dann über walt’s! 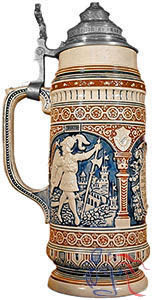 (And approaching such a stein, my heart overflows! First text string is adapted from a poem entitled Der Fünfundsechziger (The Sixty-five), written by Josef Viktor von Scheffel (1826-1886).